Fill a spray bottle with warm water, then spray one small section (10 square feet) of ceiling at a time. Let it sit for about 20 minutes. Don’t over saturate the popcorn coating, as it could damage the underlying drywall surface. 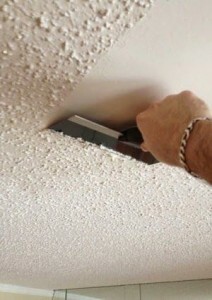 Slowly remove the popcorn coating from the drywall with a wide drywall scraper, working one section at a time. Before touching up with drywall compound, roll up the drop cloth and plastic sheeting. Take them outside, and shake out into a garbage bin. Lay the plastic sheeting back down, or lay down drop cloths before proceeding to the next step. Apply drywall compound to any problem areas using a drywall knife to get a smooth skim. Allow to dry overnight, then lightly sand and wipe clean with a sanding block and damp cloth. Paint the ceiling with paint and roller with an extension attachment. Use a tinted paint that dries white to help you with the process.